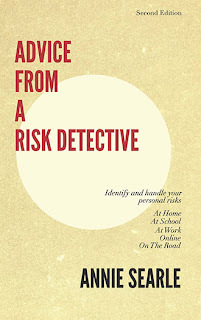 Advice From A Risk Detective: Have a safe Halloween! As the East Coast struggles with power and infrastructure issues, and its people struggle with the loss in some cases of their homes, we celebrate Halloween tonight. In most neighborhoods, children will go door to door to say "Trick or treat" -- code for "please pass over some candy." At our house each year, my husband carves a range of pumpkins. He does the small ones with a scalpel. And we watch carefully to be sure that a fire does not inadvertently start from a pumpkin that has started to smoulder. In our neighborhood, parents accompany small children to trick or treat. This is more parents out on one evening than any other night of the year, minimizing the risk to all children. I hope that your Halloween will be bright with children...and that, sometime during the day today, you might stop to make a donation to the American Red Cross on behalf of all those still struggling on the East Coast. Happy Halloween, from our home to yours!